A dog’s core muscles help it to stand, sit and move with balance and control. To test how strong your dog’s core muscles are get them to stand still and count how many seconds they can remain still without shifting their weight or moving their feet. 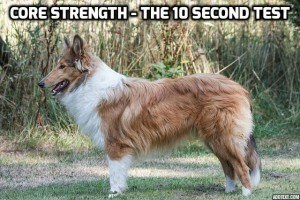 A strong dog should be able to manage 10 seconds or more. As dogs get older or if they have joint or spinal problems their core muscles become increasingly important as they are needed to take over from some of the weaker structures. These exercises are very gentle but if your dog has an existing injury or condition be very careful not to over do things and check with your vet if you are not sure. If you notice any increase in discomfort after the exercises reduce the number of repetitions and allow time to rest and recover between sessions. Always work on a firm, nonslip surface. Slow walking – When a dog walks slowly the muscles have to work harder to maintain balance – try it yourself and you’ll see! Walking on uneven ground – this asks the muscles to work even harder to maintain balance. Find a walk through woodland or in rough grass or in the sand dunes rather than always on pavements. Head moves up and down in standing – Get your dog to follow a toy or treat with their nose while they remain standing still. As they move their head up the weight is shifted to the back legs and as they move their head down the weight is shifted to their front legs. Each time their core muscles have to work to keep them standing still. Only move the treat or toy enough to shift the weight without the dog having to sit or move their feet. Increase the movements as your dog gets stronger. Start with 3 repetitions in each direction and build up to doing this 3 times a day. As your dog gets stronger build up from 3 to 10 repetitions. Head move side to side in standing – as above but move the treat to the dogs left and right so their weight is shifted over both left feet or both right feet. Again, only move the treat as far as the dog can manage without moving their feet and gradually increase the movement as your dog gets stronger. Start with 3 repetitions in each direction and build up to doing this 3 times a day. As your dog gets stronger build up from 3 to 10 repetitions. Sit to stand without moving their feet and keeping their feet tucked under their body. If your dog has a sloppy sit try standing with them between you and a wall or backed into a corner. Start with 3 repetitions 3 times a day and build up to 10 repetitions. Lifting a paw – Lift each of your dog’s paws in turn and hold for 3 -10 seconds depending on how long they can manage without moving their other feet. Begin by holding the paw close to the ground and gradually raise it higher as your dog gets stronger. You should start to feel that there is less weight on the paw you are holding as they get stronger. Start with just doing each paw once and build up to 5 repetitions of each paw 3 times a day.